Whatever it is, there’s someone out there who thinks they can make it better. So it is with THE CONGRESS, a science fiction what if story that shows corporations experiencing an unobstructed pathway to record profits. If only they could get rid of those pesky people. Robin Wright plays a fictionalized version of herself. Wright never became the star she could have been. Her agent (Harvey Keitel) reminds her of this, as does the head of Miramount Pictures, a company that is an obvious amalgamation of Paramount and the all but defunct Miramax. She was praised for her roles in several films, at least two of which have become modern classics. But she is shamed for her “lousy choices,” which included raising her two children (Sami Gayle and Kodi Smit-McPhee). Now, she finds herself being offered the last contract of her career. The Weinstein-like Jeff Green (Danny Huston) wants her to sign over her likeness and range of emotion so they can be committed to a series of computer data banks. The studio will then in turn own her and be able to put her in all the empty-headed Hollywood blockbusters they wanted her to make in the first place. Beyond the initial contract negotiations, she will have no say in the manner in which she is used. Also, she is forbidden from acting in anything ever again. She is signing the death warrant on her professional career. This is already a barbaric notion, but so far it’s not too far out of the realm of possibility. Wright is an ironic casting choice. Though she did not participate in these effects herself, she famously co-starred in FORREST GUMP, one of the first films to splice actors into newsreel footage, thus altering the original purpose of the footage. Of course, that was meant to help tell a story, but there have been more insidious moves over the last couple decades. Taking ownership of actors and molding them according to their designs is in effect taking ownership of what makes them talented individuals to begin with. Through digital manipulation, studios and marketing geniuses can lay claim to an actor’s range of emotions. What they can’t provide is the artistry of knowing when, where and how to provide them. Another factor they don’t count on is that artists continue to inspire us. An actor will find exciting new ways to interpret a role in a manner that can’t be quantified with mathematical code. Computers can only give us tweaks and software upgrades, but they cannot provide innovation of the spirit. And yet, some have attempted to do this already. Fortunately, whenever someone gets the idea to have Fred Astaire sell vacuum cleaners or cast Lawrence Olivier as a de facto villain, these acts have been met with more protests than acclaim… at least, for now. Wright reluctantly agrees to the contract, mainly due to concerns regarding her son, who is slowly losing his sight and hearing. Sure enough, they put her into a bunch of sci-fi action epics. Though I would argue that it is highly unlikely that films pumped out on a Hollywood assembly line would look this original. The immediate real world comparison I can find for the amusing “Badass Agent Robin” vignettes would be the most bombastic parts of SUCKER PUNCH, but these seem more nuanced than that. Wright’s new films are green screen epics, but they also switch from black and white to color and at one point feature a hilarious homage to DR. STRANGELOVE. Heck, I’d see that movie, probably twice. No, if those in power had their druthers, I fear everything would look like everything else. There would be nothing to make any product stand out from another. It would look as sleek, indistinct and cookie cutter as the most generic entertainment being slopped on our lunch plates today. But no matter, it keeps things in THE CONGRESS interesting. Robin Wright undergoes the process that will sign the death warrant on her professional life. Twenty years pass, and Wright enters the studio grounds in order to renegotiate her contract. Only it’s not a studio any of us would recognize today. She approaches a gate that stands in the middle of nowhere. The guard appears to be guarding nothing, and I suppose that is the point. The digital rendering that began with actors has now gone to the next level as the entire Miramount lot is an “animated zone.” After sipping an ampoule, Wright becomes a cartoon of herself. The empty plane becomes a multi-colored 2-D expressionist wonderland that again seems too out there for the folks in business suits. But don’t worry; there are still stops for advertising along the way. She drifts through the lavishly drawn lobby of the studio hotel, as everyone around her mingles in the decadence this new technology allows. The surroundings show an undeniable Ralph Bakshi influence, had Bakshi created an animated GREAT GATSBY. The next step in the contract is saying goodbye to film altogether. Now, they want to negotiate the rights to the actress’ essence, so that people can drink a concoction and become her at will. It’s the final insult that proves Green and his ilk always saw product not artists. Green grits his teeth as he looks forward to getting rid of that other thorn in the side of filmmaking – the writer. THE CONGRESS takes some even sharper turns at this point, as we are introduced to revolutionaries only to go even further into the future and discover a world where your mood, identity or even being can be realized with a single thought. 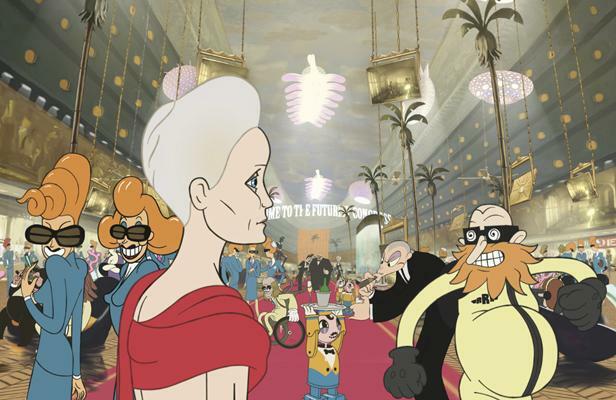 The film is based on THE FUTUROLOGICAL CONGRESS by Polish author Stanislaw Lem, though it naturally takes quite a few radical departures from the source material. Lem was often called the Soviet Arthur C. Clarke, though his work remains even more popular in certain countries. However, this label paints a slightly distorted portrait of the author’s writing. He was often wildly satirical, rarely more so than in this particular novel. He dealt with exploration and the what ifs of sci-fi but also seemed to be equally concerned with commenting on the state of the present world, as well as journeying deep into the psyche in order to figure out what makes us individuals. This latter course can be seen in his most popular novel, SOLARIS. These are the two elements Ari Folman (WALTZ WITH BASHIR) attempts to balance in his adaptation. He gets off to a rocky start in establishing the characters. Robin Wright is very good in this imagined version of herself and Harvey Keitel turns in a fine performance as her agent. He recites a crucial monologue that turns out to be the most touching confessional in the entire film. Folman has success exploring the emotional side of the story, but seems to stumble when it comes to overt satire. Danny Huston plays Green with comic book villainy, a point that is beaten in even further as people in the studio continue to spit out hatred and bile, talking acerbically and expressing their cruelty in the pettiest of ways. By the time Folman presents the people from the movie studio as actual Nazis, it’s just way too much. It’s the handling of people, with the exception of Wright, Keitel and to a lesser extent Paul Giamatti, that is Folman’s major stumbling block. For a film that deals with humanity and individuality, it is odd that everyone starts out the film speaking eloquently, yet unlike any person I have come across. This unfortunately includes Wright’s children, who should be the emotional tether of the film. Gayle and McPhee are talented actors, yet they seem more like half-realized avatars than anything Wright encounters later in the film, when the film actually slips into animation. 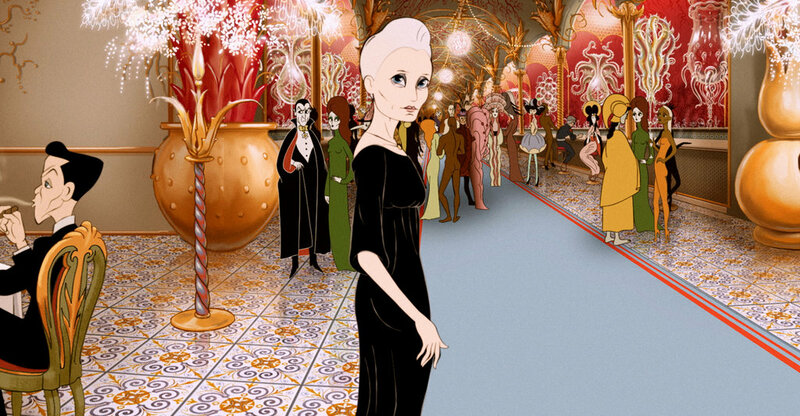 If Ralph Bakshi had created an animated Great Gatsby, it might look like this. Ironically, things drastically improve when we enter the animated world around the 45 minute mark. For the next hour and fifteen minutes, Folman does a mostly successful job of tackling the bigger themes of THE CONGRESS. Those themes include a world’s seemingly insatiable need for product, to consume. Every product that is churned out is immediately and eagerly devoured until it becomes an ingrained, life-altering part of the public’s daily ritual. Then, the cycle repeats again with the next product being met with the inevitable same result. 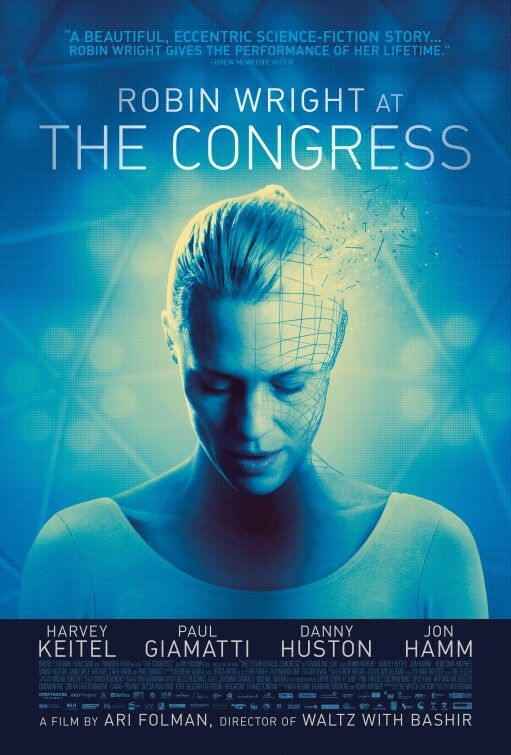 THE CONGRESS is one of the most fascinating yet frustrating films of 2014. Folman struggles to present all these amazing ideas, holding onto most while others fall helplessly by the wayside. Despite the film’s shortcomings, I’m sure I will be revisiting it more than once, simply to take in the beauty of the moments that work and absorb everything it has to tell us. Robin Wright goes on an epic journey inward. She crosses different times, different realities, where everything is altered. She is a victim of this world that robs us of our individuality, that puts a price tag on everything, that treats everyone as a commodity, as currency. She tries to remain true, only to lose her way, just as we all do. And yet, at the end, there is the ideal that we can all achieve if only we grasp onto it tightly enough. Humanity – beautiful, flawed, endlessly remarkable humanity. Recommended.